As long back as 1978 when I slowly became acclimated to Krishna consciousness, one of the things that really enlivened me was live stage drama. 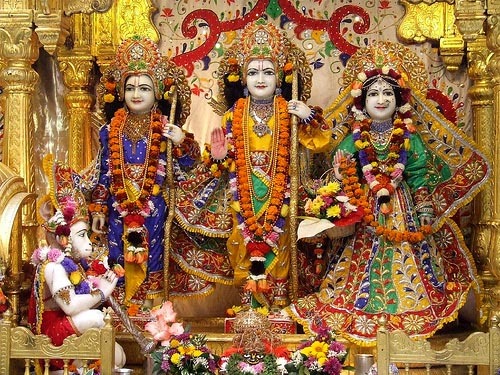 I remember being captivated by the devotee production of the "Ramayana" at the old 55th Street ISKCON Temple in New York City one evening. The character of Ravana, brilliately performed with great gusto by the late Loka Mangala das for me, was an electrifying experience and solidified my faith in the great Vedic literatures. Since that time, I have often said and believed then as I do now that it is essential that the devotees begin performing plays for audiences on an ongoing basis. Certainly Sunday feast crowds would appreciate live performance. There is no better way of presenting the conclusions of sastra than through live stage plays that are at once emotional and kinetic. While doing temple plays and "skits" is not new, it is time to do them on a rotating basis as in repertory whether they be inside the temple or at other venues accessible to the general public. It was also my desire to have a "Vedic dinner theatre" concept by which plays like "Mahabharata," "Ramayana," and various other plays be performed several evenings a week. Audiences could take in a dinner and a play. Another aspect is that this idea could also be a boon in book distributuion. That is, "buy a book see a play." Srila Prabhupada was very enlivened and enthusiastic about plays and films and stated many times that he personally felt that Vedic plays were as good as his books. It has taken me many years to finally get to a point where my acting desires have finally been realized thanks to Krishna. http://www.nextcat.com/filmbiz108 Just where this will go is anyone's guess. In order to do the type of entertainment I visualize, it takes money and many contacts. It is to this end that I hope to turn the Vedic Theatre into a concrete reality and more importantly, to create major feature films. It is in this light that in my future blog I would like to extend an invitation to devotees around the world who are interested in theatre in any capacity to read an excerpt from some original plays that I have adapted. One, to my surprise, is being presented by Eyeblink Entertainment in New York City in the Spring of 2008 titled, "The Women of Mahabharata." Since I am still doing some re-writes, I would like to present my first few pages for the pleasure of the devotees interested in wanting to present these original dramas, never before seen in ISKCON to their congregation. "Srila Vyasadeva's Story" - 60 minutes. A one-man play. "Srila Prabhupada's Story" - 60 minutes. A one-man play. This is new. Needs a brilliant devotee actor who can portray Srila Prabhupada faithfully. The entire story takes place aboard the steamship Jaladuta in Septemeber 1965 before docking in New York harbor. Very dramatic and emotional. "The Women of Mahabharata" - 60 minutes. With or without Bharat-Natyam dance. This is very accessible to multi-cultural audiences. It is also a great vehicle for five devotee women actors. Story takes place many years after the famed Battle of Kuruksetra as the women lament the loss of millions dead and some of the events leading up to the great Bharata War. In my next three blog postings I will have the first several pages from each play to give the devotees a sampling. For anyone interested in participating in these Vedic theatre projects, please e-mail the author at: Vedictheatre@aol.com.